These storms had a nasty habit of coming out of nowhere. Vast, rain-filled goliaths with the power to transform dusty tracks into raging chocolatey torrents. I took shelter under the overhang of a thatched roof, leaning against the mudbrick walls of a home nestled amongst fields of dense potato drills. I was in farmland draped along the sloping border of Volcanoes National Park (VNP) in northern Rwanda, along with my research assistant, Isaac. We had travelled here to interview farmers about how they farmed, their views on the nearby park and, most importantly, whether they have any problems farming so close to such an important protected area. As we waited for the downpour to finish (so we could hear our conversation over the din), I wondered whether the shaggy residents of the forest were taking shelter too. Situated just east of the very centre of Africa, Volcanoes National Park is an incredibly valuable "island" of biodiversity and a hotspot for life. 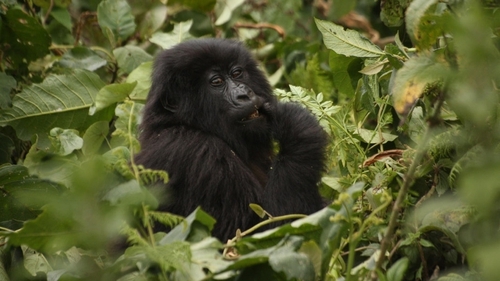 The most famous species it supports, the mountain gorilla (Gorilla beringei beringei) is found only here and in a limited area of neighbouring Uganda and the Democratic Republic of the Congo. The golden monkey (Cercopithecus mitis kandti) has an even more restricted range. VNP also supports forest elephants (Loxodonta cyclotis), Cape buffalo (Syncerus cafer) and a vast range of life we are only beginning to understand. It is thus incredibly important to science. Likewise, it is fundamental to the economy of Rwanda, as tourism – mainly centred around mountain gorilla trekking – injects US$60 million directly into Kigali’s coffers every year. The lush crags of VNP also provide rich farming soil nearby and the volcanoes’ high altitude generates a vital source of water. Sometimes a little too much. However, northern Rwanda is also one of the most densely populated regions of Africa, supporting upwards of 1,000 people per square kilometre. That equates to a suburban density of subsistence farmers. Imagine trying to grow everything you needed in your back garden. This is the challenge of the average family living on the margins of VNP. On top of space restrictions, political turmoil, rebel incursion from neighbouring DRC or the increasing human population, there are yet more limitations to farming in northern Rwanda. It is that of "crop raiding" by the animals of VNP, who regularly leave the confines of their forest refuge and seek the tasty, hard-won produce of humans. In other parts of the world where this conflict occurs, retribution killings, compensation and strong barriers are widely used to reduce the risk of damage and deal with its consequences. These are not options for the farmers on the borders of VNP, however. Across 13 months in the field, my research found that a wide suite of species (most of which are protected) regularly damage the crops of subsistence farmers. Buffalos dominate in terms of damage, while gorillas, forest elephants and other smaller mammals make up the rest. Yet owing to their protected status and tourism value, local farmers are restricted from taking affirmative action. All that prevents the animals from leaving the park is a one metre high, poorly maintained drystone wall, where it exists at all. Those places where it is best maintained and complemented by an internal ditch coincide with entry points for tourist groups who pay upwards of $700 per person to see forest’s elusive ambassadors. In part, it is due to the success of conservation efforts that populations of protected species are now healthy enough to spill out of the park. This does not necessarily point to a lack of food in the forest. Human crops could simply be tastier and are certainly easier to gather. And if humans are forbidden from taking action, farmers will continue to be the losers in this conflict. One final and important problem remains for the farmers working these fertile slopes. In the not-too-distant past, those affected could stop growing crops targeted by animals or mix several crops together to reduce damage and improve soil fertility. This flexibility no longer exists, as the Rwandan government now increasingly controls the crops that each field should contain and when they are grown. Disobedient farmers are fined and instructed to pull up their "contraband" food crops. One priority crop now grown on a massive scale, by decree, is the pyrethrum flower, extracts of which are used in cosmetics and organic pesticides by western pharmaceutical companies who hold valuable contracts with semi-state companies. All of this means that any damage perpetrated by the hulking brown masses of buffalo have a much greater impact on livelihoods and lives, by reducing the variety of foods grown. For the Rwandan economy this is good news but, for local farmers, things look bleak. As the rain subsides, and the lifting mist reveals glistening fields, we resume our conversation with the young farmer cooking tiny potatoes on an open charcoal fire. "It's the law. If you don't grow ibireti (pyrethrum) you lose your land", she says. "There is hunger because we are not using our land to grow peas and maize. We are forced." Her opinion of VNP conservation was perhaps most telling: "we are also in need of good care. We have to conserve ourselves, and then conserve nature. Tourists visit gorillas, not buffalo."